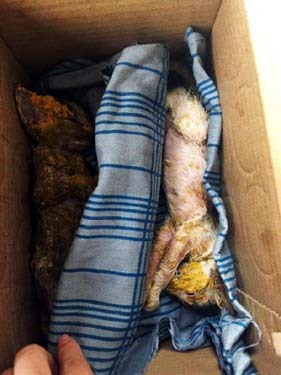 NEW YORK -- A Croghan man was arrested Monday and accused of failing to care for 10 animals. 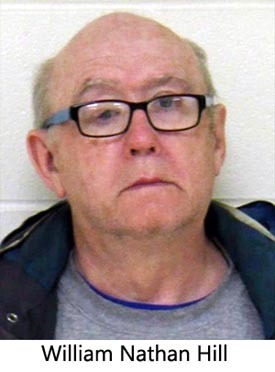 Duane Koster, 61, of Croghan, is charged with animal cruelty. According to the Lewis County Sheriff's Office, Kloster allegedly failed to provide veterinary care for six cows and four horses. The cows and one of the horses died. Kloster will appear at Town of Croghan court at a later date. 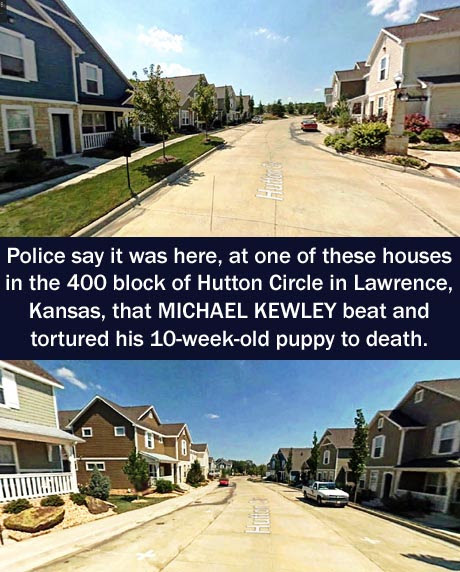 KANSAS -- A Lawrence man faces felony charges after he was accused of killing a 10-week-old puppy and threatening a victim he shared the animal with, police said. Michael L. Kewley is charged with felony animal cruelty and making criminal threats and misdemeanor criminal restraint, according to court documents. Thursday night the victim arrived at the home she shared with Kewley in the 400 block of Hutton Circle and found the dog, possibly a Labrador mix, to be unresponsive, said Lawrence police spokesman Sgt. Trent McKinley. The dog had vomited and was showing signs of head trauma and bowel issues. When asked what happened, Kewley told the victim the dog "might have" eaten broken glass, McKinley said, and when she tried to leave with the dog, he threatened her and damaged property. Eventually the dog was taken to a 24-hour veterinary clinic in the Kansas City area where it died early Friday morning from what the doctor listed as "severe head trauma," McKinley said. Police were called Friday morning when Kewley and the victim argued again, McKinley said. He was arrested that morning and made his first appearance in court Monday afternoon, when he was officially charged. Kewley's preliminary hearing has been scheduled for 2 p.m. Thursday. He is currently being held in the Douglas County Jail in lieu of a $7,500 bond. KCTV5 talked to the girlfriend off-camera. She didn't want to be identified, but said her boyfriend is a military veteran who suffers from post-traumatic stress disorder. She admits she wasn't there when it happened, but said he claims to have had a drink and dropped the glass. The puppy supposedly tried to lick it up and he didn't want the dog licking glass, so he says he "pushed it away". 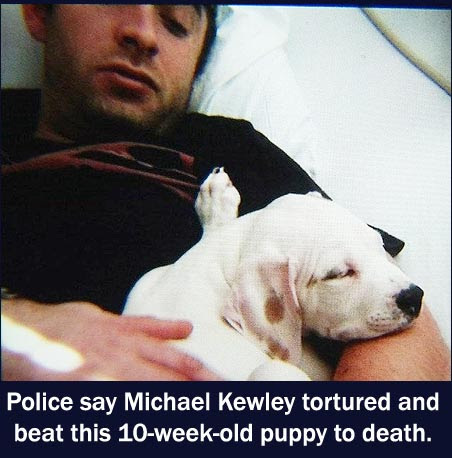 The girlfriend said when Kewley realized what he'd beaten the puppy to death, it allegedly "triggered an episode of PTSD". She said prosecutors are working with her to get Kewley the help he needs. Kewley was taken to the Douglas County jail where he has since been hit with charges of animal cruelty, criminal threat and criminal restraint, two felonies and a misdemeanor. A roommate told police he saw Kewley abusing dogs, the affidavit says. 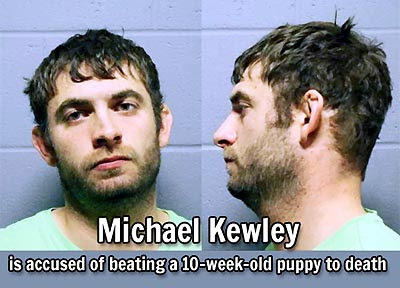 Once he reportedly strung a dog up by the neck over a cross bar and a second time he hung a dog by a heavy bag stand, according to the affidavit, though Kewley maintained he was "just training" the dogs. 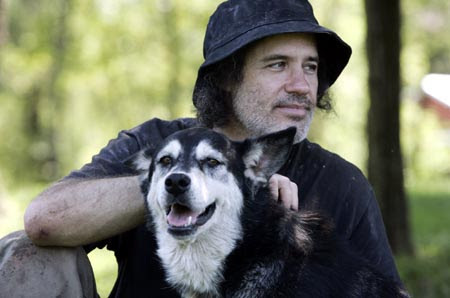 New Jersey: Why is Cliff Zager allowed to have 12 wolf hybrid dogs? 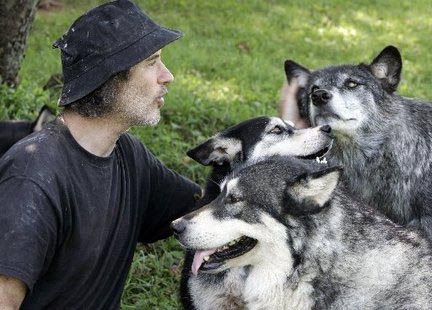 NEW JERSEY -- Cliff Zager is used to the false alarms — calls from residents alerting him that one or more of his 12 wolf-dog hybrids escaped his fenced, 9-acre property. "I'm usually inside," he said, days after two were on the loose for about two-and-a-half hours. "They're outside. I never know they're out until I get a phone call" and then take a count. Most of the time and "thankfully," he said, a caller has confused his wolf-dogs with other large dogs, such as Huskies, or coyotes. On Saturday he did what he always does when any of the hybrids are loose; he walked his property to learn where they got out and plug the hole. "I don't go looking for them," Zager said, because a search isn't likely to yield fruitful results. These are shy and quick-footed animals. They're not leash-trained. Preventing any more of his pets from escaping is Zager's top priority. On Saturday he found that a piece of fencing added to the bottom of his property-encircling 8-foot fence, to account for a drop in ground level in a stream, had rusted and broken free. A quick repair, while keeping the rest of the pack inside the fence, prevents the escapees from returning to their Spring Garden Road home. They always do, said Zager, because of the wolf in them: "It's instinctual," the drive to "return to the pack." He relies on that pack to alert him to the return of loose pets. Over the weekend he saw his animals "race to the fence. I ran outside; I was looking for" the two loose dogs and didn't see them. 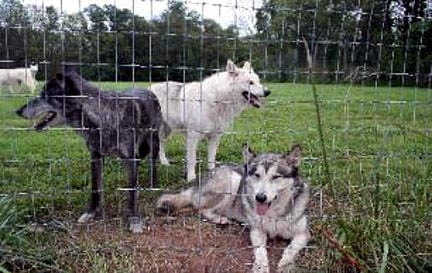 Just as suddenly, the 10 still-fenced wolf-dogs "ran to the other side of the property." Zager followed and this time saw his other two pets. The pack is fed a raw diet, mostly meat. He changed feeding times to evenings after neighbors complained that the leftovers were drawing large numbers of vultures to the neighborhood. Zager also keeps cans of dog food on hand, however, using them to to lead the escapees to a gate and back on his property. Mayor Ray Krov said this week that the township hadn't received any reports of problems caused by the loose wolf-dogs. He wasn't in office at the time, but remembered that neighbors complained about a spate of escapes, and a dead neighborhood cat, that led to a 2009 proposal to ban wolf-dogs in the township. It never passed. Zager called wolf-dogs "very interesting" and "very curious" animals. "They have to do their exploring, then it's time to come back to the pack. They can get into squabbles, but they have a very strong sense of family." 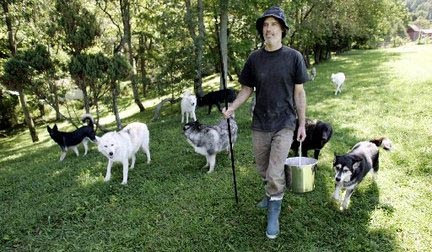 He said he has a "very deep connection to them," but doesn't cross the line to referring to his 14 dogs — two aren't hybrids — as "children." "They're my non-human family," said a man with no wife or children. He works from his home, running a dog-walking business in New York City. He owned and looked after dogs for many years. When a favorite Siberian Husky-German Shepherd dog died, he wanted "an animal that looked like her" and turned to a "low-content wolf-dog breeder." Such hybrids favor the "dog" part of their heritage. Zager intended to buy one, but took two after a litter-mate's adoption fell through. "I had a bunch of dogs and they were older," he said. Nearly 10 years ago he moved to Holland Township from an apartment, inspiring him to "take the next step up" and adopt more wolf-dogs. "I had a lot of dog experience, 'I thought I really will be able to work with'" the hybrids. He did his research, learning that an 8-foot fence was required, as well as a dig guard underneath. He admits to mistakes, one being the decision to fence the entire property, which put the fence alongside hedge rows. When trees fall or large branches break, the fence is compromised. Another was a rookie dog-owner error — forgetting that those "small, so cute and friendly" easily managed puppies would grow large. Expanding beyond low-content hybrids, he bought two puppies, then kept going. While he tried to create a "human bond" with each of the "normally shy" wolf-dogs, he said he has had varying degrees of success. Some of the wolf-dogs will "wash" his face with their tongues, he said, and all will eat from his hand and follow him. They all know their names and respond, even if they don't obey. Zager said he failed to leash-train the hybrids, which he now regrets, and said three don't seek human contact. A mobile veterinarian comes to his property when needed and to provide routine care. He does not breed the wolf-dogs. "I've made mistakes," he said again, but feels strongly that he "made the commitment" to care for the hybrids "for the length of their lives." They have a life-span similar to that of large dogs, and Zager's pack ranges in age from 5 to 12. When one or more of his pets escapes, he said, "It's very stressful for me. I do a little quick praying that they'll return" safely, and without causing harm to anything. He doesn't encourage people who denigrate neighbors who fear a wolf-dog escape. "I'm worried about my family and they're worried about their families. I'm not uncaring, I'm just trying to take care of my situation." Further, he said, "I can put myself in their shoes." The wolf-dogs "should not be getting out." 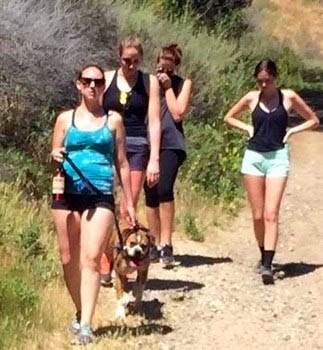 UPDATE: The owner of the vicious dog has been tracked down: "OC Animal Care locates owner of dog that attacked horses, rider in O'Neill park"
CALIFORNIA -- A dog believed to be a boxer mix attacked three Icelandic horses and their riders on a trail Friday in O'Neill Regional Park in Trabuco Canyon, officials say. One of the riders was thrown off her horse during the attack and was taken to a local hospital, according to an official with the O'Neill Regional Park Rangers. 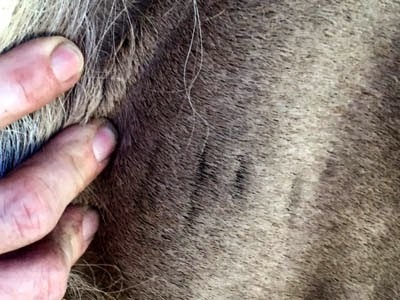 Two of the three horses suffered bite marks. 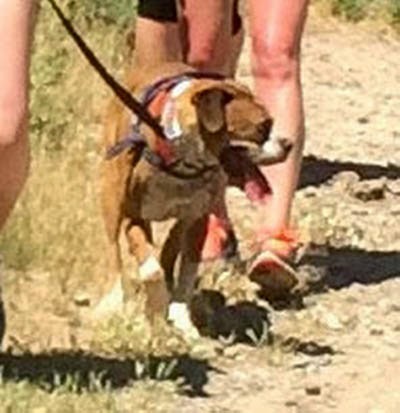 Helga Thordarson, of Trabuco Canyon, who was one of the riders, posted about the attack on Facebook and is asking for help identifying the dog's owner. She said the dog, which she estimates weighed 95 pounds, then turned around and bit her friend's horse on the neck and legs. "The attack was completely unprovoked," said Thordarson. 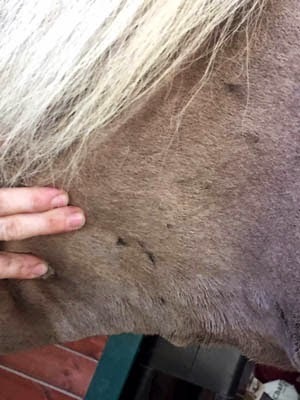 The dog continued to attack the horses for three to five minutes and her horse, Tyr, was bitten multiple times, she said. One picture of Tyr's neck she posted shows multiple bite wounds. She said her friend was thrown off her horse. The attack stopped after Tyr fought back. After the attack, Thordarson approached the dog's owner and said she was given contact information but has not been able to reach the woman. Thordarson also submitted a report to the O'Neill park rangers. Thordarson posted a picture of a group of women with a dog on her Facebook. She is asking anyone who may know the women to contact the rangers. "The reason why I posted their picture is because my vet and Animal Control officials said any time there is a bite attack, the animal needs to be quarantined and tested for rabies," Thordarson said. 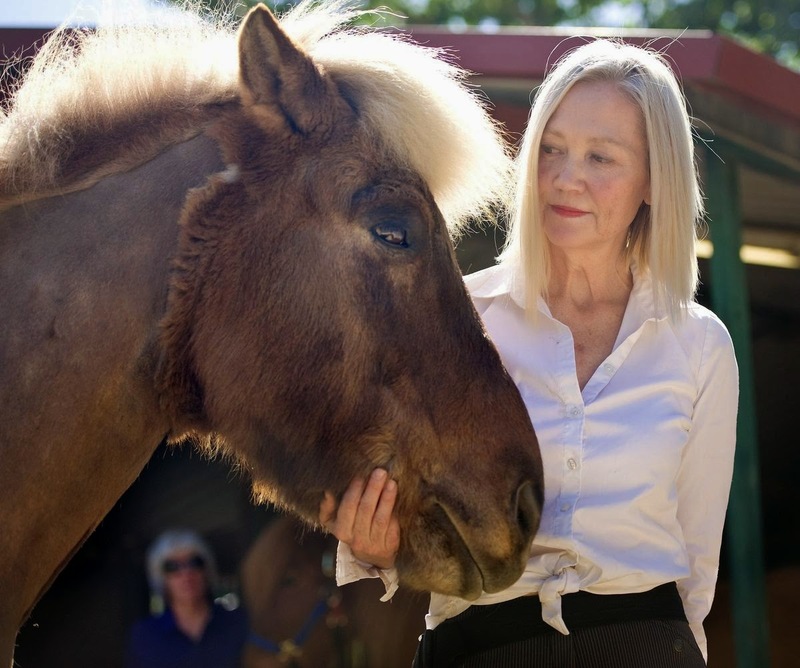 Thordarson said her horse is on strong antibiotics. Another horse has a jagged cut on its leg. Her friend, she said, is "black and blue" but otherwise okay after being thrown off the horse. "I'm just glad nothing tragic happened," she said. "It could have been much worse. We were on a ledge. These are original Viking horses. They didn't panic and defended us." O'Neill Regional Park is situated in Trabuco and Live Oak Canyons. The park is a popular place to hike, camp and picnic. 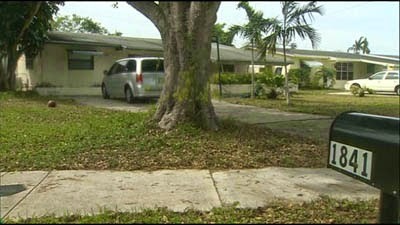 FLORIDA -- When a dog pounced on a boy and began biting him, the child's relatives and a neighbor rushed to the boy's aid, witnesses say. They beat the dog with a skateboard, broom and belt — anything they could find — to stop the animal Saturday afternoon. Yet the canine was difficult to fend off. The attack sent the boy and an adult relative, both of whom suffered bite wounds, to the hospital. "The dog just kept going back to the kid and attacking the kid," said Larry Szpyra, 64, a neighbor who heard the screams and witnessed the attack. "Just a nasty situation." It happened about 3 p.m. Saturday in the 1800 block of Southwest 43rd Avenue in Broadview Park, an unincorporated neighborhood west of Fort Lauderdale. The names of the dog-bite victims haven't been released, so their latest conditions were unavailable. Neighbors said the boy is about 9 or 10 years old. "The adult sustained more serious injuries than the child," said Mike Jachles, a spokesman for Broward Sheriff Fire Rescue. Szpyra lives across the street from where the attack happened. He saw the dog dart down the road and head straight for a boy riding his bike in his driveway, he said. "No provocation whatsoever," Szpyra said. "[The dog] just attacked the little boy and jumped on his back. I don't know how badly he was bitten but he started screaming." The boy's sister grabbed a skateboard and started hitting the dog, trying to stop the attack, Szpyra said. A woman, believed by neighbors to be the boy's mother, used a broom handle to also hit the animal. Their efforts weren't enough. The dog kept attacking, neighbors said. Donna Hartog, 68, another neighbor, said she heard the child's mother scream. The dog's mouth was covered in what appeared to be blood, she said. "The mouth was totally red," she said. A 21-year-old neighbor heard the screams and ran out of his home to help everyone. 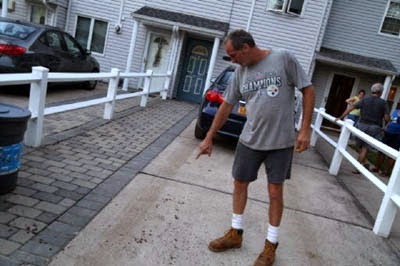 He used a belt to hit the dog, neighbors said. The 21-year-old man's father, Jean Justine, said his son only suffered a scratch while helping. The dog followed Justine's son to Justine's home. "When my son saw that dog again, he got inside" the home, Justine said. "The dog was really crazy." 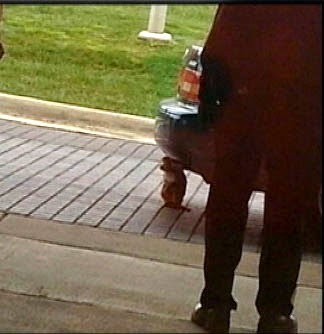 At some point, a woman drove up to where the dog was and took the animal away. "She must have been looking for him, knowing he was loose," Hartog said. "She's screaming, 'Stop beating the dog! Stop beating the dog!'" Broward Sheriff Fire Rescue said the agency's central Broward units responded to assist the child and adult who suffered the dog-bite wounds. The patients were taken to Broward Health Medical Center. After the dog attack, an animal control unit and a sheriff's deputy responded to the home where the dog apparently lived. The dog was confiscated. A woman at that home, who was crying, declined to comment. Neighbors saw the dog running loose in the neighborhood several times before, they said. "That dog needs to be gone," Justine said. NORTH CAROLINA -- The pit bull that attacked an 84-year-old woman Tuesday will be euthanized, Cumberland County Animal Control said. The woman was working in her yard in the College Lakes neighborhood when the dog, Bane, knocked her down and started biting her arms, according to the woman's statement to Animal Control. 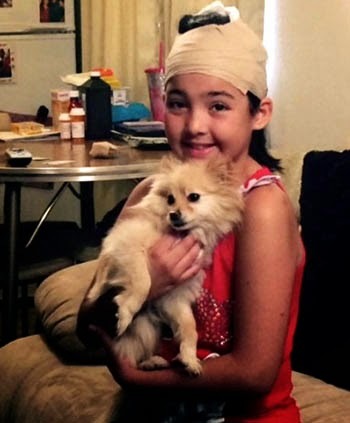 COLORADO -- Brianna Leos is 11 years old and a dog lover. Her Teacup Pomeranian Chloe is her best friend. "I'm not afraid of the small dogs, I'm afraid of the big dogs," Leos said. She's afraid of big dogs as of Sunday afternoon, after Evans Police say a neighbor's pit bull mix attacked her, causing serious injuries to the back of her skull. It also left scratches on her back. "I was playing in the front and my next door neighbor [was] coming outside [and] the pit bull just ran through the door," she said. "I was trying to run to my house as fast as I can, right as I got to the porch, the dog just came and attacked me." "I heard her scream, the way she screamed, I knew something was wrong," said Tasha Guerrero, Brianna's mom. Weld County doesn't ban any breed of dog. The family says the next door neighbor warned them about one of his pets when he moved in about a month ago. "The one who attacked her was adopted and it was abused previously," Guerrero said. "And it had issues with women. He told us not to approach it, pet it, anything like that." After the attack, Evans police decided to keep the dog quarantined inside the home, which is allowed under city policy. "To me, you see a dog does this, sees the injuries, you don't leave it at home," Guerrero said. "There is no sense in the world for you to leave that dog to go back inside. Especially if it got out the first time by mistake. That's not OK."
But on Monday, the officer saw Brianna's injuries and decided to move the quarantine to the Weld County Animal Shelter. And now the city tells 9NEWS it might be looking at the long-standing quarantine policy. "Because of this event, I think we can look at it and make any changes that we feel are necessary," said Evans Police Commander Chad Harding. Brianna says she doesn't blame her neighbor, just his dog. The dog owner was given a citation for having a vicious animal. He didn't want to talk to 9NEWS on camera, but told 9NEWS crime and justice reporter Anastasiya Bolton he rescued this dog and the dog also rescued him, when he was going through a hard time. However, he told Bolton he's decided to have the dog euthanized. The city says it will first have to quarantine the animal for 10 days. Guerrero reached out to 9NEWS anchor Kyler Dyer Monday morning looking for resources for her daughter. Dyer suffered a dog attack on live TV in 2012. ARKANSAS -- A child suffered head-to-toe injuries after being attacked by pit bulls, and is currently hospitalized. According to Bill Hickman with the Union County Sheriff's Office, deputies received a call around 6 p.m. Thursday from a hospital in regards to a 6-year-old having been attacked by pit bulls. An investigation is said to have found that two 8-month-old pit bulls and one adult pit bull attacked the child. Hickman said the child was playing with the puppies when the attack happened, and after the child screamed, the mother dog got involved. He said the family had difficulty separating the dogs and the child. Hickman said the 6-year-old was airlifted to Arkansas Children's Hospital, and there is no word on his current condition. According to Hickman, charges may not be possible at this point. There are said to have been no previous signs of the dogs being aggressive, and the child had played with them before without any problems. THV11 is following this story and will update the article as more information is released. 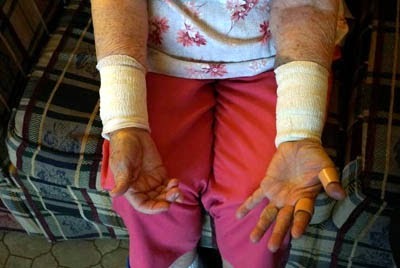 NEW YORK -- A 66-year-old woman, whose arm was mangled in a pit bull attack two years ago on a Dongan Hills street, has accepted a $450,000 settlement, said her lawyer. 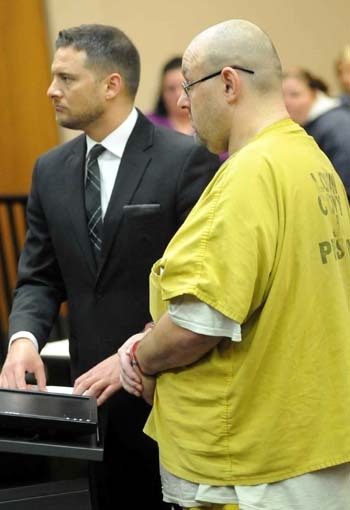 Lucille Fundaro suffered severe injuries to her arm, requiring extensive surgery and agonizing skin grafts, said her lawyer, Anthony L. Ameduri. The terrifying attack occurred on Aug. 24, 2013, on Dumont Avenue, a quiet residential street, according to court papers and Advance reports. 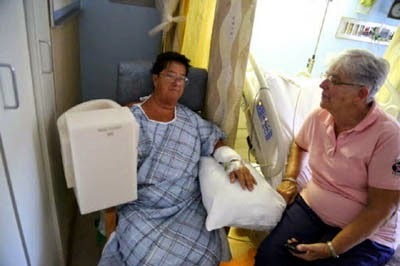 In a hospital interview afterward, Ms. Fundaro, a New Dorp resident, told the Advance she was attending a barbecue on Dumont when she left to greet a friend across the street. That's when she saw a pit bull charge at her, she said. Ms. Fundaro, whose home had been battered 10 months earlier by Hurricane Sandy, said she stood her ground as the dog tore a thick chunk of flesh from the underside of her right forearm, exposing the bone. A second, smaller pit bull then came over and began sniffing a piece of her flesh, which the larger dog had ripped from her forearm and had dropped on the pavement, she said. The smaller dog's actions distracted the larger dog, allowing her to escape and quite possibly saving her life, Ms. Fundaro told the Advance. 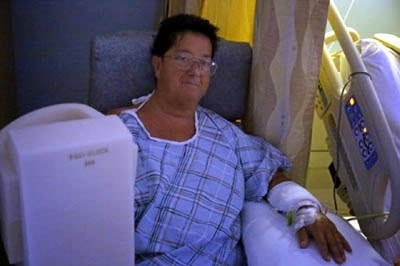 Ms. Fundaro was treated at Staten Island University Hospital, Ocean Breeze, where she underwent several surgeries and skin grafts, said Ameduri. Ms. Fundaro sued Helaine DeSilva, who owned the property where the dogs were housed, along with the residents Britney and Carlos Novoa, the lawyer said. She alleged the defendants failed to control and maintain the dogs, which, according to neighbors, had vicious propensities, Ameduri said. The suit was filed in state Supreme Court, St. George, and was recently settled with the defendants' insurance carrier before trial, said Ameduri, a partner in the West Brighton firm Ameduri, Galante, D'Agostino & Friscia. 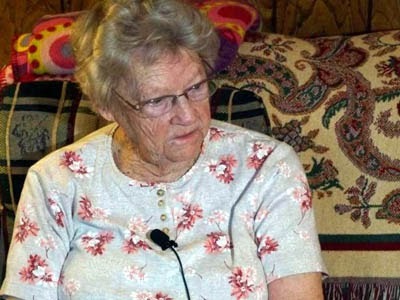 NORTH CAROLINA -- An 84-year-old Fayetteville woman is recovering after she was attacked by a dog while tending to shrubs outside her home. Hallie Hall was working in her front yard in the College Lakes neighborhood Tuesday when she said a pit bull jumped on her and tried to bite her head. 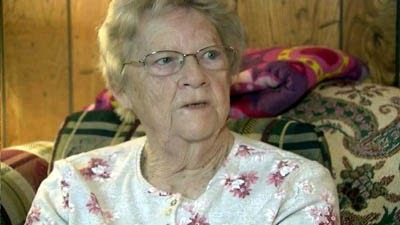 Hall was able to get inside her house and call 911. 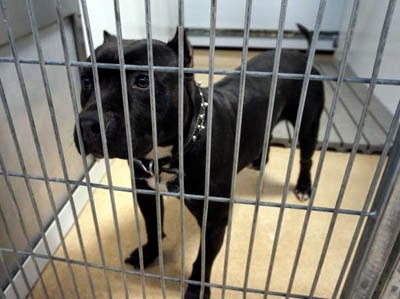 A 7-year-old boy who lives nearby was walking another dog and accidentally left a gate open, letting the pit bull out. The dog's owner said he didn't know the dog was vicious. Hall was bitten on both arms and several fingers. She said the attack is something she will never forget. "He come up to me and he come flying around the house, and he jumped on me and threw me down and started biting me," she said. Hall said the attack lasted about 30 seconds but seemed longer. The dog "tried to get my head and my throat," she said. "He got around my throat, but I was fighting him with my hands and pushing him and kicking and everything I could do. That was a bad experience. I thought to myself, 'I'm going to lay here and die.'" The dog is in the custody of Cumberland County Animal Control, where director Dr. John Lauby evaluated the case and decided not to issue a dangerous dog permit to the owner. 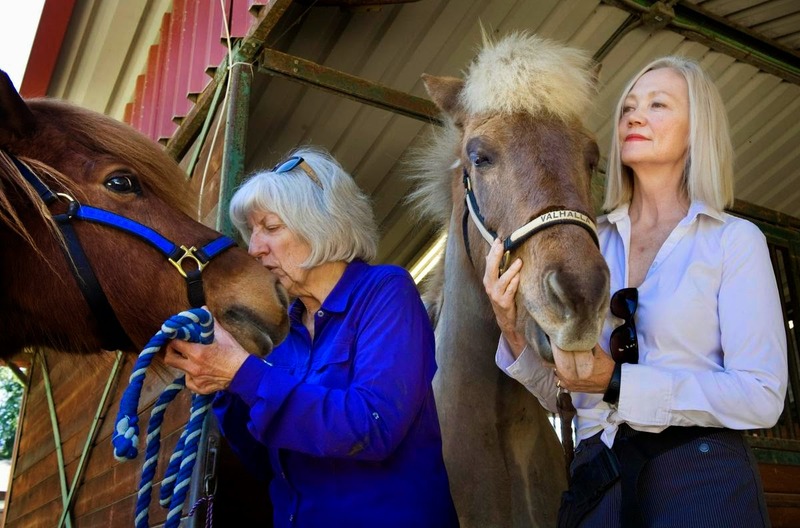 "Some people love their animals no matter what and say, 'I want to bring it back home.' But a dog with this kind of behavioral situation is a potential time bomb in the home," he said. 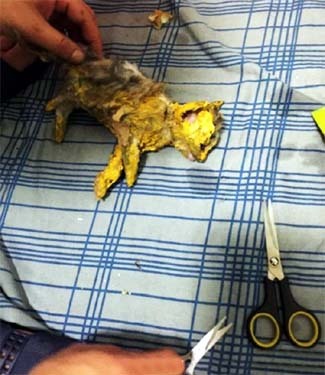 CHINA -- Two kittens were rescued after being covered from head to toe in yellow paint and abandoned at the side of a road. 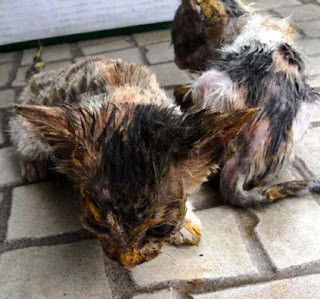 Kind-hearted Yue You Meng, 27, said she heard the kittens calling when she was walking near her home in the city of Guangzhou in southern China's Guangdong province. She said, "I realized the sound was coming from a cardboard box and when I opened it up I saw the two kittens inside covered in sticky yellow paint. "It had almost dried and their legs were stuck together, they were stuck together, and even their eyes had been closed by the paint. "They were in pitiful state so I picked up the box and took them home where I tried to clean off some of the paint." But the task proved impossible so the next day she took the kittens to an animal shelter where a vet worked painstakingly for several hours to slowly remove the dry paint. 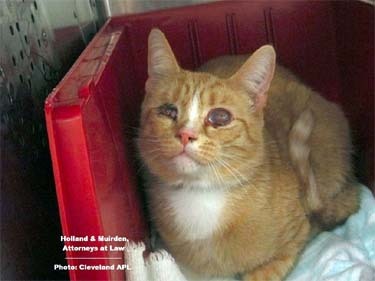 She said, "They are better now and can walk around and don't seem to have suffered any permanent damage to their eyes or ears but they still look really poorly because they had so much fur cut off." 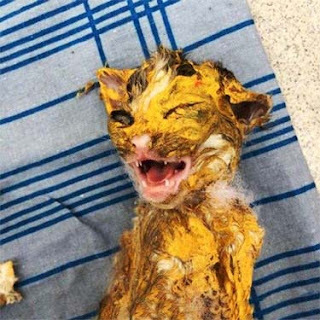 China has NO ANIMAL CRUELTY LAWS so police are not investigating the incident and it's unclear whether the kittens were accidentally covered in paint and abandoned or deliberately targeted before being dumped to die. 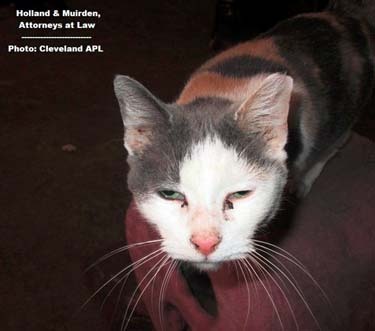 OHIO -- Three more of the volunteers who ran The Cat Crossing shelter that was raided Jan. 28 by the Cleveland Animal Protective League face charges. 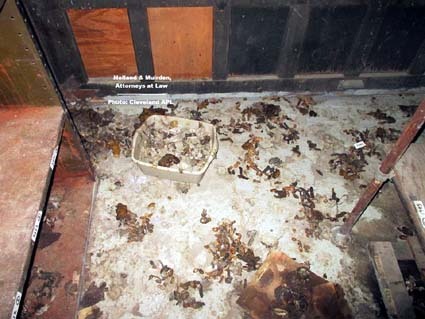 Marian Lowes, 56, of Rocky River, is charged with obstructing justice, obstructing official business, two counts of neglecting 147 cats and three counts of keeping animals in filthy conditions. Steven Smith, 58, of Rocky River, is charged with two counts of neglecting the same cats and three counts related to filthy conditions. And Jessica Oslander, 31, of Cleveland, faces 26 counts of neglect related to filthy conditions and lack of veterinary care. She has a felony criminal history in Florida that includes domestic violence and fraud. Many of the charges are first-degree misdemeanors that carry maximum sentences of six months in jail and a $1,000 fine. 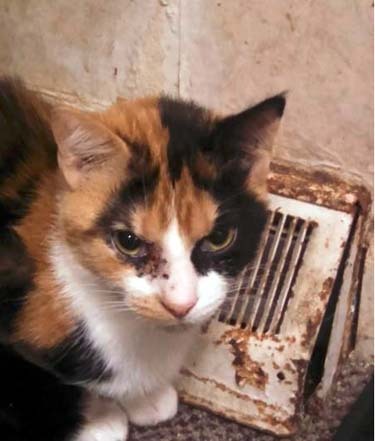 Lowes was charged with obstructing because she "was present when the search warrant was served and an on-site impound of all cats was ordered," APL Chief Animal Control Officer Jed Mignano said. "Lowes removed a cat from the premises in order to conceal the cat, which is evidence in an investigation." infection and ear mites after being at the shelter for five months. The trio will be arraigned next month in Cleveland Municipal Court soon after the court appearances of two other defendants, Mary Wawrytko, 64, and Joseph Scott Gray, 50. Those two were charged last week with a total of 52 counts of animal neglect and are due in court Thursday, April 2. Gray and Wawrytko both live at the West 25th Street shelter where the 147 cats were confiscated. More than 86 percent of the cats were ill, and 21 had to be euthanized due to complications of feline leukemia or feline immunodeficiency virus and other infections, the APL's veterinarian said. Wawrytko co-founded The Cat Crossing in 2012 and rented a former warehouse in the Ohio City neighborhood soon after she faced the same complaints about ill cats and unsanitary conditions at her previous home on Columbus Road in the nearby Flats. 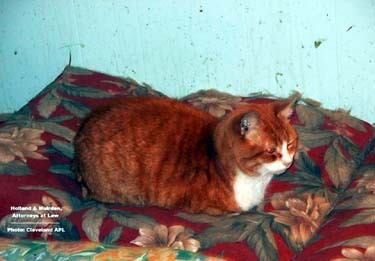 Many of the confiscated Cat Crossing cats are now healthy enough for adoption. 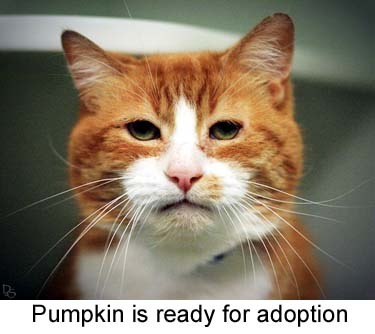 The Cleveland APL still has 45 of them; 31 are available for $45 each at 1729 Willey Ave. The Friendship Animal Protective League, 8303 Murray Ridge Road, Elyria, took 27 of the cats off the APL's hands and still has 19 available for $10 each. 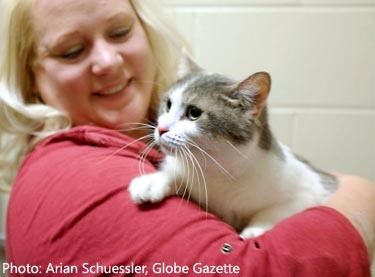 And Tails From the City took 17 of the cats into its shelter on Cleveland's West Side. Six of those still need homes. Fill out an adoption application at tailsfromthecitycleveland.org. 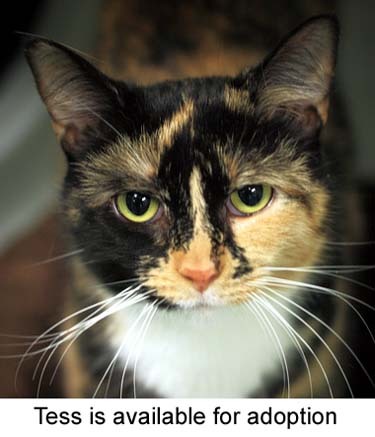 "Unfortunately, all of the cats were exposed to FIV and FeLV at Cat Crossing, so we will need to retest them, free of charge, in April," Harvey said. "We are looking for homes where the Cat Crossing cats will be the only cat or where they can be isolated from other cats until they can be retested. 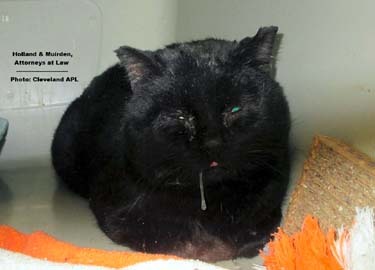 The cats adopted from Friendship in Elyria can be retested there." NORTH CAROLINA -- Police in North Carolina are looking for a monkey that they say attacked a maintenance worker in a hospital parking lot. Charlotte-Mecklenburg Police said animal control officers were called to Carolinas Medical Center-University Wednesday about the report of a monkey on the loose in the parking lot. A statement from the hospital said the monkey was contained in a bin by the maintenance worker until the officers could arrive. The monkey apparently attacked the worker, and escaped into a nearby wooded area. Authorities say the monkey’s owner came to the hospital to help search for the animal. Poice say the owner was cited last March for refusing to turn the monkey over to officers after being issued a city ordinance violation for having an exotic animal inside city limits. 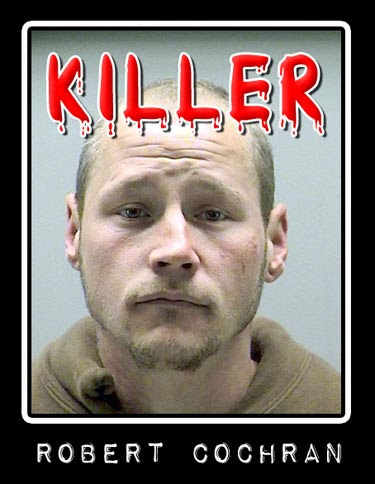 OHIO -- Convicted dog killer John Wayne Daughney will spend the next six months behind bars stemming from the strangulation death of his pet, Memphis. Daughney, 36, of 3106 Cromwell Drive, appeared March 25 in Lorain Municipal Court Judge Thomas Elwell’s courtroom, where he was sentenced to 180 days in jail on charges of killing or injuring animals and cruelty to companion animals. Daughney pleaded no contest to the charges March 2 after being indicted on animal cruelty charges. He was charged after police said he hung Memphis, a 130-pound mastiff, on the side of a trailer by its chain collar, causing it to choke to death. Memphis was discovered by officers Jan. 31 in the area of Euclid Avenue and River Industrial Parkway. During the investigation, while speaking with Daughney, officers discovered that he took in the animal, but said he didn’t want it anymore because it was (allegedly) violent to his other pets. Prior to receiving his punishment, Daughney said he was remorseful for what he did and vowed to never do it again. 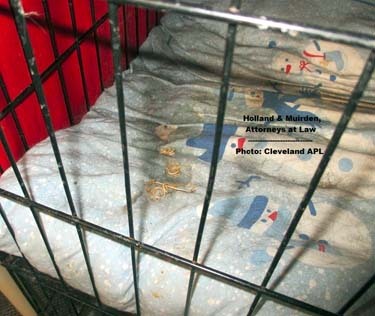 After seeing police photos of Memphis the day the canine was discovered, Lorain County Prosecutor Jeffrey Szabo urged Elwell to impose the maximum penalty on Daughney. 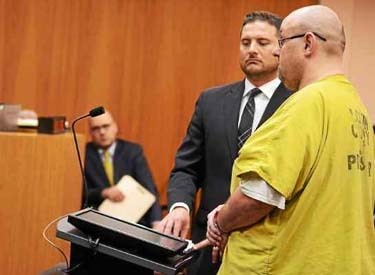 Given Daughney’s prior criminal background involving violence, Elwell said he had no choice but to sentence Daughney to six months of incarceration for the crime. So is the judge saying he would've given him a slap on the wrist for strangling a poor animal to death if he hadn't already had previous convictions of assault??? 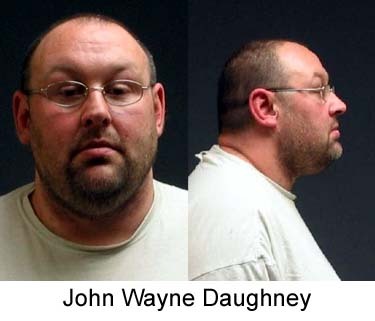 Daughney is set to serve out his jail sentence at the Lorain County Correctional Facility. IOWA -- A Mason City man has confessed to throwing a bag containing a live cat into the Winnebago River, police say. William Nathan Hill, 69, was charged with misdemeanor animal torture on Wednesday. Police say Hill threw a gym bag containing his own calico cat into the river on Saturday. It was witnessed by two people, who went down to the river and found a live cat in the bag, officials say. Hill turned himself in to police on Wednesday morning, said Mason City Police Sgt. Tiffany Creekmur. The cat survived. It was taken by Mason City Animal Control. Shelter staff nicknamed the cat Winnie — short for the Winnebago River — and hope to adopt it out to a good home, said Humane Society of North Iowa Executive Director Sybil Soukup. The Mason City animal-rescue organization has heard from many angry animal lovers since news of the alleged incident broke on Tuesday. "They want to see justice served, so this arrest will definitely give some resolution to this whole issue and hopefully we can move forward and adopt her into a forever home," Soukup said. Hill was cited and released. A phone number for Hill couldn't be found on Wednesday. It wasn't clear if he had retained an attorney. 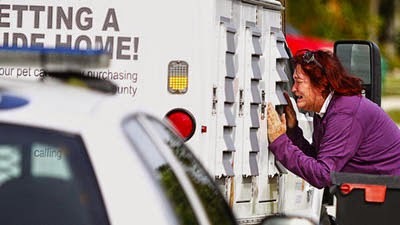 OHIO -- Police said a man in Moraine shot and killed a pit bull at his home and tried to discard the animal with the garbage. 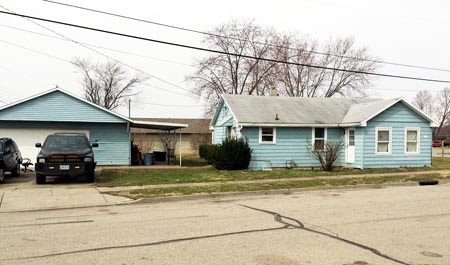 A pit bull mother and a litter of puppies remained at the home on Lakehurst Court, but animal control was expected to remove at least the mother because she was not licensed, according to a Moraine police report. Robert Anthony Cochran, 29, is being held in the Montgomery County Jail on suspicion of cruelty to animals and tampering with evidence. Police got a tip that someone shot the dog and was trying to get rid of it. Officers responded but the resident denied the allegation and wouldn’t allow police to search the home, according to the report. Some time later, a witness called police to report seeing the suspect dragging a trash can to another house. The Montgomery County Animal Resource Center responded along with police and the remains of a pit bull were found in a black bag. It had apparently been shot to death and police found evidence the animal was shot in the suspect’s garage, according to the report. Police said a witness reported she was visiting the house the previous night and the dog got spooked and bit her. 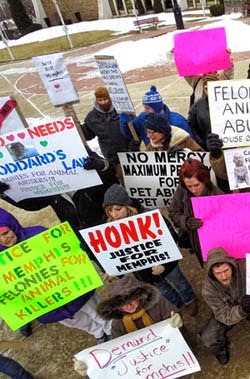 Court records show Cochran was convicted of animal cruelty in 2012. In February that year police were searching the suspect’s home as part of a drug trafficking investigation and found a dog carcass in the freezer and a cat that was suffering from open sores on its face, according to court records. Corchran was given a 90-day jail sentence, which was suspended providing that he stayed away from animals for one year. IOWA -- The city of Onawa says the dog is a dangerous animal. 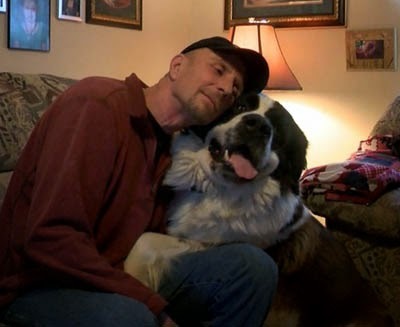 The dog's owner says his St. Bernard is a gentle giant. 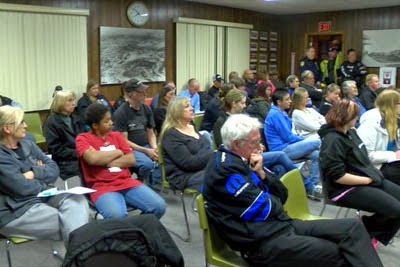 Dozens of people packed inside the Onawa City Council meeting Tuesday to hear what they would decide about the future of the dog and whether it should be classified as dangerous. 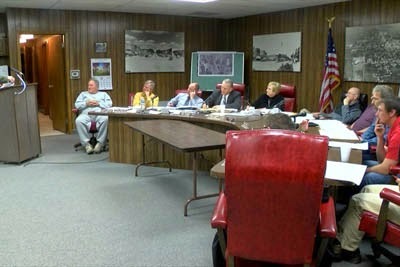 After an hour or so of debating, no hard decisions were made at Tuesday night's city council meeting in Onawa over the future of a local St. Bernard. The city is arguing that the dog is a danger and something must be done to stop it from hurting someone in the future. The dog's owner says the St. Bernard is a therapy animal, his lifeline and is just a gentle giant. Roughly 50 people packed inside Onawa's City Hall building Tuesday night to talk about the future of a St. Bernard in the community. The city and the dog's owner are at odds over Zhivago the dog. But earlier in the day, Zhivago's owner, Billy Parker, says a city council member stopped by to meet the dog and see about its temperament himself. "And the whole time, his tail was wagging. The hair wasn't standing up on the back of his neck or anything like that," said Billy Parker, Zhivago's Owner. Parker says he knows his dog is big and he knows he can seem frightening. But he says he believes his dog is just a gentle giant whose never hurt, or bitten anyone. "If he was in the house and you knocked on the door, he may bark. But if you're already in the house and sitting down, he'll just come up and crawl right up in your lap and just lick your face," Parker said. Parker presented at Tuesday's council meeting, acknowledging that his pet had gotten loose in the neighborhood before but stresses the dog isn't a danger, though he may seem it. Other community members came out to testify that they've been frightened by the St. Bernard in the past. Police say the dog has not bitten anyone, to their knowledge. But you can classify the dog as a dangerous, vicious animal according to city codes if it 'worries' community members, and a few residents came forward Tuesday saying that it had done so in the past. One of the residents who came forward was a 13-year-old Onawa boy, who says the dog chased him one day while he was biking. So they're NOT trying to take his dog. They're simply trying to get the dog to have court-ordered restrictions on it since the owner isn't taking it seriously. "I saw a dog. It charged at me. I ran, using the bike to fend it off. It kept on running at me, so then I threw the bike down and went to bang on the doors hoping someone was there," said Shawn Holton, a 13-year-old Onawa resident. Holton says the dog did not try to bite him. But he was very scared by it. "It chased me. So, I just don't want anyone to hurt it and I don't want the dog put down at all," Holton said. Onawa's Police Chief and others presented to council that the dog was potentially dangerous to the community. The city council member who visited the dog earlier in the day argued that he could easily see where the dog would frighten people, but stressed the dog had many opportunities to bite multiple people and never did. Unable to immediately decide what to do about the dog, council gave the okay to move the decision until their next council meeting April 14. They also discussed changing the ordinance so other options for the future of the dog, for example, allowing for a steep fence to house the dog in the yard, could be considered. In the meantime, a South Dakota woman has donated a large kennel to the Parker family for Zhivago, so they can keep him outside safely.